Prefinished Hardwood Flooring has taken off in today’s flooring world as an alternative to sand and finish traditional hardwood flooring. Engineered to last longer with a multiple core inside. Pre Finished Hardwood flooring has been Engineered to get rid of issues that are common with sand and finish like cracks and expansion. That is why it is a good choice for climates like CO.
Pre finished hardwood floors come in the 5 or 7 inch planks which are much wider than your traditional hardwood floors. With these planks you get a really beautiful floor. Pre-Finished Hardwood is the perfect option for those who are remodeling as you are able to walk on the floor immediately upon installation vs Sanded Finish Hardwood which takes up to 72 hours to dry. Another benefit is that this can be installed below grade and over concrete in a floating installation method. We are cash and carry (materials only) on our hardwood flooring. If you are looking for exceptional customer service and the best deals on carpet or flooring in the “Denver Metro” area we are the company for you. Our unique selling approach allows us to bring product to the end-user at the lowest possible price. 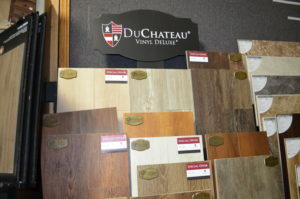 Luxury Vinyl Tile (LVT) is a plank looking product that can be made to look like wood or tile and it is very life like. That is why it is the fastest growing product in the flooring industry. LVT has only been around for about 8 years. It is much more versatile than laminate. It is great for kitchens and bathrooms were water can be an issue. Laminate is plastic that was introduced 25 years ago. Laminate typically has a wood core so it is not great in the bathroom or kitchen where it could get wet and can expand. Price is similar for either one $1.50 to $4 a foot. Coventry Flooring installs LVT and carpet. We are cash and carry for laminate products. Pricing is by square foot and will depend on lots of issues based on what your actual floor is like. We will come out and do an estimate for you to see what your job would involve. Give us a call today and schedule an appointment with our mobile or regular showroom. We will come out to your home with samples or you can come to our location by 8th and I-25.